Jeju’s inaugural street hockey Jeju Cup ended on Sunday, July 13, with a 3-1 Jungmun Jets win over Gwakji Kings in the final. Six teams had battled it out since noon in the rain and slippery conditions to raise 1 million won for the Jeju Inline Academy, the Jeju City hockey club where the event was held. The event was the brainchild of former professional ice hockey player, and regular Jeju Weekly contributor, Dave Cunning, who wanted to increase the number of local children playing the game. 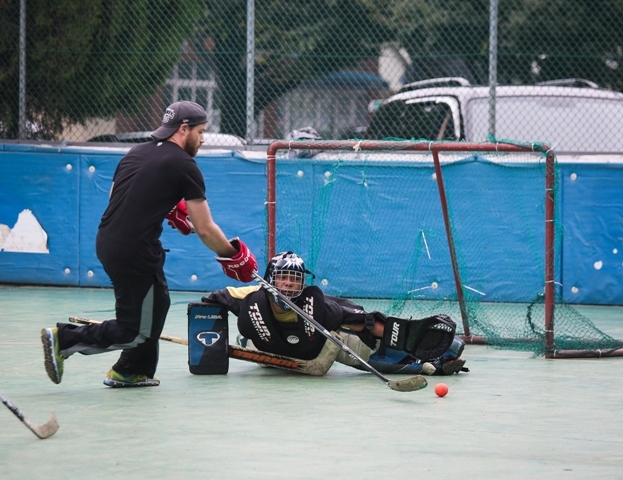 Canadian Cunning played professionally in Europe and hopes to see more participation in the street hockey variant of the game. He said this of the event success. 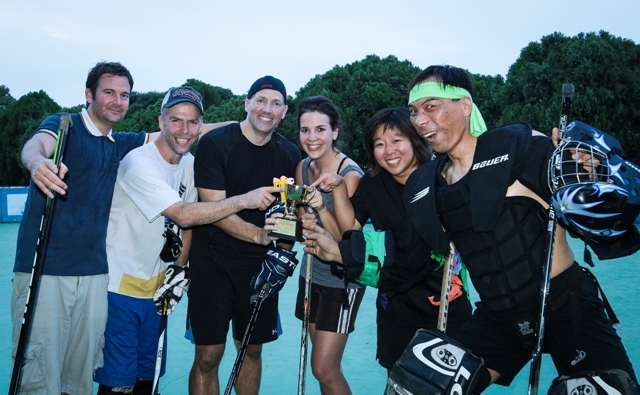 “The inaugural Jeju Cup street hockey tournament was a total success. While the event only lasted a day, its accomplishments were built on the foundation of many months of hard work,” said Cunning. He added that it was thanks to the support of partners Warrior Hockey and Canadian Ball Hockey Korea that the game was even able to get off the ground after they provided the necessary sticks and gear. This allowed more people to get involved and the weekly games grew into a six-team charity tournament. “Our event saw many volunteers selflessly donate their time and talents, and nearly 40 players of five different nationalities – some with various degrees of experience, but many who were playing hockey for the first time ever – help pull off a very enjoyable day competition,” said Cunning. Initially the funds raised were to be used for buying outfield kit for the beneficiary academy managed by Kim Cheol-bae, but Cunning decided goalie gear would be better value. “Goalie gear is exponentially more expensive than player gear. Having a goaltender adds a whole other dimension to hockey ... and it will allow the kids to try a new position, and enjoy the game from a whole new perspective,” said Cunning. Many among the players had never played street hockey before. Tournament winner Joel Laubhan was pleased he took part. “The tournament was organised very well and all the players were so cool. Feeling banged up today ... But it was worth it!! Super time,” said the American. Another poster, Yumi Kang of champions Jungmun Jets, even predicted the event would rank alongside her “most unforgettable memories in 2014.” Cunning added that he hopes this lays the foundations for a fruitful future for Jeju hockey. “We want to see hockey permanently installed into the island's sporting community. With the feedback we’ve received so far, I’m quite certain hockey in Jeju is headed in the right direction to reach that goal too,” he said. For more information and to get involved, visit the Jeju Islanders hockey Facebook group here. You can read Dave Cunning's blog here.